Mediums: Gesso, Modeling Paste, Dylusion Ink, Pens, Acrylic paints. Stencils from Tando Creative; Rollerball and Sundburst by Andy Skinner. Dreamweaver, birds. 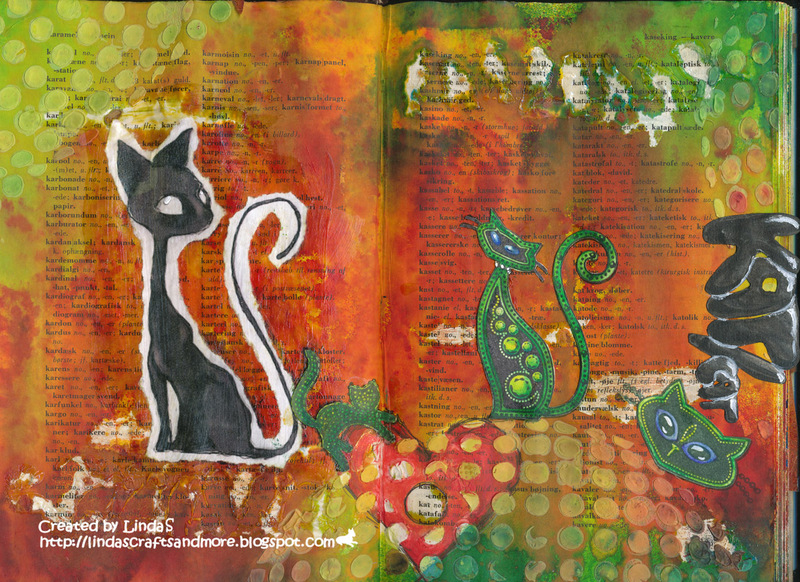 Cat Stamps; Inkadinkado colored with Inktense. The words KAT/cat and heart is handdrawn by me. Black cat: Credit to vincent by tim burton by Charlotte Walker, printed. Oh, how delightful! LOVE your kats! This is delightful - Love your "Kats" and the pretty colors. Your mixed media design is grans!! Love your cat pages, fabulous colours on the background.